The central bank warned that "growth of economic activity has slowed from its solid rate in the fourth quarter". It said: "Recent indicators point to slower growth of household spending and business fixed investment in the first quarter." Joe Manimbo, senior market analyst at Western Union Business Solutions, said: "The Fed did a big about-face on policy. "The fact that the Fed threw in the towel on a 2019 rate hike was particularly dovish." Fed chairman Jerome Powell maintained his stance that the central bank would continue to be "patient", telling a press conference: "It may be some time before the outlook for jobs and inflation calls clearly for a change in policy." The dollar fell against the Japanese yen and the euro, but was higher against the pound which was trading lower as tensions heightened over the UK's exit from the European Union next week. Analysis of the so-called "dot plot - where members of the Fed's Federal Open Market Committee indicate where they expect interest rates to move to - also revealed that they anticipate only one increase in 2020. 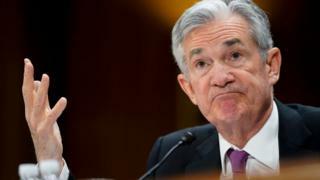 Mr Powell said that there was a positive outlook for the rest of the year, with the unemployment rate under 4% and inflation below the central bank's 2% target. But he said that "we are also very mindful of what the risks are", which include slower global growth and no resolution on either Brexit or US-China trade talks. The Fed is getting just a little more wary about economic prospects. For sure, these developments are nothing like as dramatic as a cut in interest rates would have been. Nobody expected that and we didn't get one. There is also a striking contrast between the growth that Feds policymakers think the US can sustain - about 2% - and what President Trump's administration believes is achievable, which is more like 3%. That difference matters. If at some stage in the future the Fed thinks the economy is overheating it will raise rates. President Trump has criticised the Fed for rate rises it has already made, and he won't like it any more if they resume.